Steeped in rich cultural history, Western Europe is the familiar gold-standard travel destination for millions of Americans. Curious adventure-seekers cast their sights further a field, looking at European excursions like a well worn, but lovable hat. Why bother trekking out to see the same stuffy thousand year-old cathedral when you can hitchhike on a milk truck through the Laos jungle glimpsing the ruins of a mysterious civilization? But how many of these so-called "adventurers" can say they've been deep within the world's oldest functioning sewer? A city's storm drains, sewers and waterworks make up an immense shadow city beneath the feet of the citizenry above. Unlike American sewers, which have separate sewage and storm drains, European sewers are an awe-inspiring network of combined wastewater channels. Some cities are so proud of their sewers, they conduct guided tours. Ooze is about to embark on a life-long dream - a dark and stinky dream that boils beneath the great European cities. We will shed light on these filthy underground lairs and invite the world come to see them as the beautiful disease-battling constructions they are. You won't find this tour in the Fodor's Guide. I'll be going to each of these sites, explaining how to get there and what you see. This will be accompanied by background information on the history of these projects tied into a breezy history of plumbing and citywide waterworks. I'll be interviewing workers, official and un-official tour guides, and city natives about their relationship to the drains and sewers of their hometowns. All this will help fellow urban adventurers plan a trip they will never forgot, much less be able to wash off without a good scrubbing. The Seine River was too small to handle 19th century Paris' burgeoning waste and stank so bad that many people fled its banks. Many tunnels were dug and connected, creating a new lifesaving sewer system. Proud of their achievement, turn of the century sewer workers led boat cruises down the sewers for ladies and gentlemen dressed in their Sunday best. That tradition continues today by the Eiffel Tower in Les Egouts de Paris! Travelling a few hundred yards down a fully functional waste-filled tunnel lined with interesting displays well described in English, visitors can read about the evolution of the world's longest sewer system. 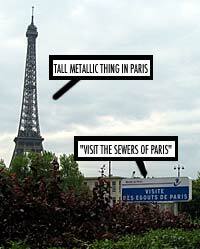 Here's one place the normally snotty Parisians are happy to you visit. Until 1869, the river Senne served as an open sewer flowing through the Belgian capital. Brussels still dumps most of its waste in the river, but it's now covered, and city workers guide tourists into its bowels. Always environmentally friendly, the city still proudly dumps the sewage, 75% untreated, into the North Sea. Take that, England! 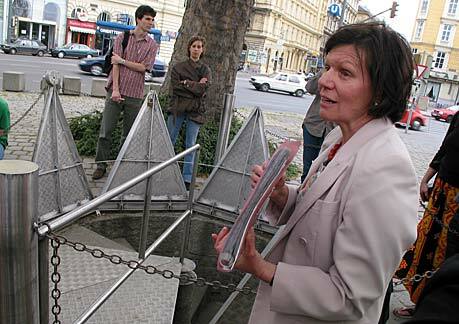 Vienna has the oldest "modern" sewer system in Europe. The giant vaults of the Vienna sewer are opened for two different tours that play off the 1948 Orson Welles film, "The Third Man." The film ends with a dramatic firefight in the sewers that's reenacted by sewer workers in one of the tours! The other one, a much more serious tour for film buffs, features a 1/2 mile candle-lit trek along the underground banks of the Vienna river. Apparently the movie, released 54 years ago, looms large in the minds of its inhabitants- or at least its tourists. Finished in 1907, Prague's original sewer system was barely changed until the mid-1960's when it was finally upgraded to serve the growing metropolis. The Ecotechnical Sewer Museum is housed in an original turn-of-the-century water treatment plant where you can go down and see the original sewer system in all its glory. Then go under the main plaza in the center of town, down some steps, and visit the Foriegn Dignitary Sewer Gallery - so posh for slosh. The oldest discovered plumbing dates to 8000 B.C. in Scotalnd where indoor troughs carrying water and wastes to a nearby creek were discovered. 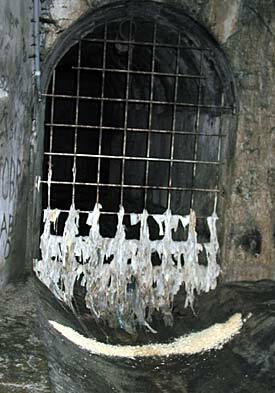 But the granddaddy of all modern city sewers is in Rome -the "Cloacae Maxima"- started in 735 B.C. and not finished until 225 years later and is still used today. Running under the Roman Forum to the Tiber River, both ends are still easily viewed- but Ooze is doing more than that. We've contacted an organization that's taking us wading through the sewer itself! There are all kinds of sewers to visit throughout Europe. We're going to go to see what we can of the sewers in London, Barcelona, Brighton, and Hamburg. Then we'll visit a sewer museum in Manchester, sewer rats in Emmen, Holland, and walk some giant ancient poopy pipes in Trier, Germany. Europe is just full of this crap. Ooze is immensely qualified to conduct this historic investigation. We've produced an website since 1994, a book, THE FINGER: A COMPREHENSIVE GUIDE TO FLIPPING OFF that reached #75 on the Amazon Hot100 before our publisher declared bankruptcy and been paid to work in the new and exciting field of Television. We've been interviewed on 50 different radio shows, a few TV shows, and fooled major media outlets into thinking we are conservative Christians upset by Star Wars (toolofsatan.org) Ooze can speak English fluently, and can communicate in tongues when the spirit compels us.